It's hard to imagine this, but at some point in the future I will tire of riding elephants and buzzers through Kyrat in Far Cry 4 and turn my attention to other games once again. When that day finally comes, I think I'll get back to another open world game, Skyrim, and start a new character using the Perkus Maximus mod that completely re-imagines the game's perks and skills. While some of Skyrim's skills and perks are just fine as-is, you have to admit a number of them are completely phoned in. Take Enchantment. That's a super useful skill, but most of its perks are simple modifiers to make your enchantments stronger. While stronger enchantments are a good thing, it's hard not to be bored with selecting perks that do nothing but kick up your percentages a notch, and nearly all of the Enchantment perks do that and only that. Even the ones that don't are still passive in nature, and more than a bit dull. With the mod, you'll still get those percentile boosts that make your Enchantments stronger, but these passive effects will come along with more interesting and interactive perks, like the ability to create powerful enchantments (fireballs, shock attacks, or frost damage) that you can attach to your arrows as you fire them. You'll also be able to enchant staves and wands that recharge themselves automatically, learn the ability to tie multiple enchantments to the same weapon, and even gain the power to command your weapon to leave your hand fight on its own. 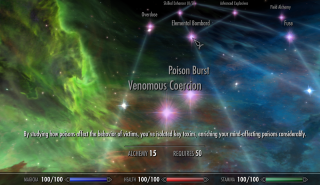 Speaking of magic, Alteration, another dreadfully boring perk tree, has been goosed to allow you to cast spells using health instead of Magicka (while that sounds dangerous, I can definitely imagine using it in a pinch), sharpen your weapons using spells, and even cast spells automatically every time you swing your sword. Conjuration has some new tricks as well, including collecting the bones of fallen foes and building an army of loyal skeletons, and even opening your own personal Oblivion gate to unleash its demonic hordes. That's just magic. Thieves can learn some new tricks as well. Dexterity has replaced Pickpocket, so in addition to learning to pick locks and rob people, you can now also learn new perks, like how to nimbly unfasten someone's armor a piece at a time or how to plant deadly crafted gadgets on their person. You'll even be able to strip someone of gear while you've got their full attention in combat, like Apollo Robbins would do if he were in Skyrim. Speechcraft and Sneak have been modified as well, allowing you to talk any NPC who likes you into becoming your follower, letting you craft useful new arrow types, and even giving you the ability to knock people unconscious and drag them away. Essentially, every skill has almost double the amount of perks than in the original game, and there are very few that require more than a rank or two of investment, so you'll be learning something new just about every time you contribute a point. For a full description of these new perks, here's a great comprehensive list, and you'll see there are changes to light and heavy weapon and armor skills as well. You'll need both the Dawnguard and Dragonborn DLC to use Perkus Maximus, as well as the Skyrim Script Extender. I installed using the Nexus Mod Manager, and you'll want to read the full install instructions contained on this page. It's not particularly hard getting it to run, but there are a few specific steps you'll need to follow.